Count Josh Kelley a fan of Napster. The Augusta, GA, native was writing songs on the side as a student at the University of Mississippi, and in a happy Internet accident, some Napstered MP3s of his work made their way to an A&R rep for Hollywood Records. 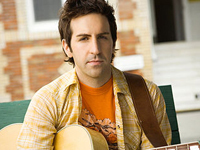 Kelley eventually signed with the label, and his debut album, For the Ride Home, appeared in June 2003. It took awhile for it to build up steam, but eventually listeners starting responding to Kelley’s affable, John Mayer-ish sound.